The absolute first thing I will always order at any tapas restaurant is the chorizo. 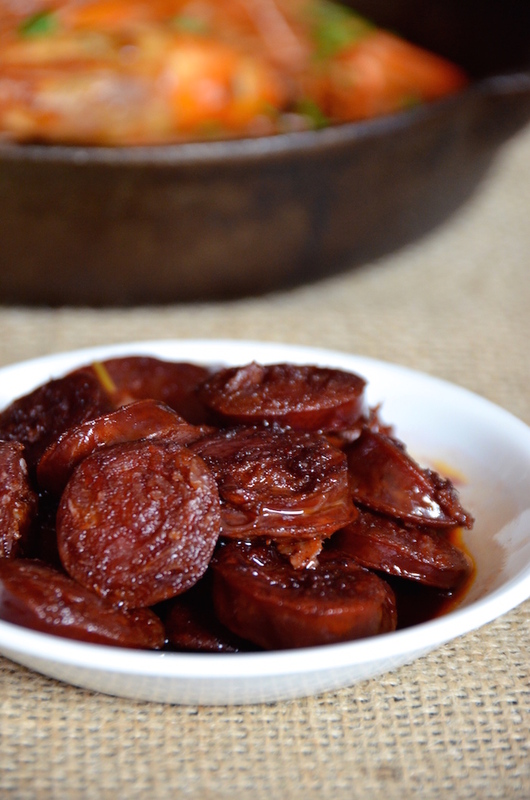 I love it in everything and served in every way, but my absolute favorite has to be the simply fried chorizo in red wine. Just a handful of ingredients, with tons of flavor. This one only takes a few minutes to prepare, but it's always a hit. Serve it with some chunks of bread on the side for sopping up the flavorful wine oil at the bottom. Heat oil in a small skillet over medium heat. Add the garlic and paprika, and saute just until fragrant. Add the sliced chorizo and fry for 1-2 minutes or until crisp. Add the red wine and let simmer until the wine has reduced and thickened slightly.